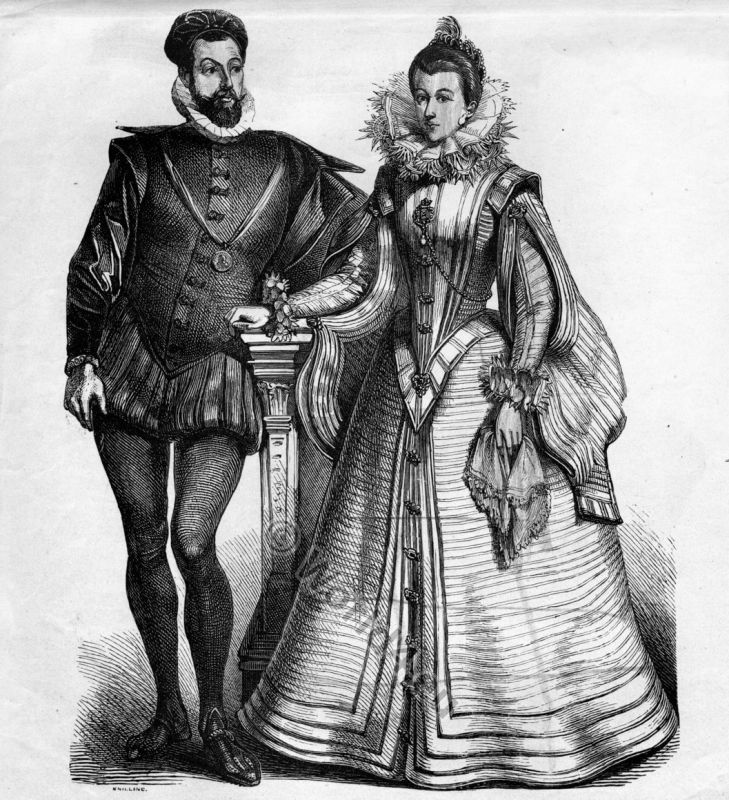 The Spanish fashion in 16th century. Home » The Spanish fashion in 16th century. 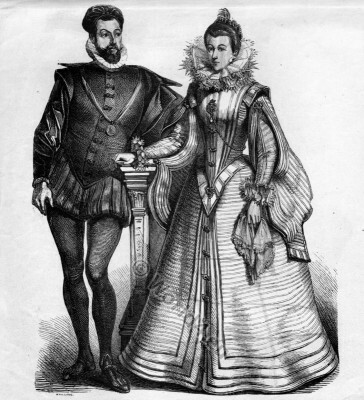 French nobility in court dress, 16th century. Renaissance era. It is the time of the late Renaissance, the Thirty Years War, marked by the Counter-Reformation, with the beginning of the Spanish baroque. In view of the dominance of Spain captured the cool elegance of the Spanish court dress the European countries. It replaced the elegant and light fashion of the renaissance as dissolute and proclaimed the modesty and chastity of the Catholic Church. The man is wearing a waist-length jacket which was named after its final form “goose belly”. It was closed by a central row of buttons. It’s padded and formed of beads on the sleeves. The sleeves and the collar was completed by ruffles cuffs. The sleeves are long with fabric ribbons, which look like a throwback to the Burgundian fashion of houppelande. The collars should develop during the era of the Spanish fashion to the so-called millstone ruffs. They strongly restricted the movement and looked like a statement. The carrier or bearer was in the most impossible positions attitude preserved. The pants had a high waist and was padded as well as the jacket and produced a wide hip. He wears buckled shoes and stockings. The clothes of the woman meets the man’s. A stiff corset bodice with drop waist. The narrow sleeves and collar are also completed by ruffles cuffs. The hairstyle is, given the limited range of motion, carried high. The skirt is floor length and richly decorated. Forward it will be kept open so that the cone-shaped bottom skirt that was also decorated came forward. The aim of the clothing was the complete concealment of the body. The women wore under the long skirt the Kothurne, the shoes were made of wood or cork. The church was full of praise for the way these uncomfortable shoes because they prevented the dance and even the physical pleasures were opposed. This entry was posted in 1550, 16th Century, Court dress, France, Headdresses, Nobility, Renaissance and tagged Collar, Houppelande, Kothurne, Millstone ruffs, Renaissance fashion era, Spanish Fashion on 9/20/13 by world4.